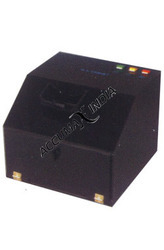 Due to our immense capability in this work domain, we have brought forth a huge variety of Colony Counter. - LED Display with audio beep at every count. - Woulffhuegel grid glass plate. - Pressure with the marker pen, a count is Registered and confirmed by an audio beep. - Full Stainless steel fabricated body duly heat Cured epoxy coated from outside for better Aesthetics. A 100 mm dia lens covers the entire illumination field and its magnifications assure highly accurate results. Counting plate with standard Wolfhugel ruling ensures clearly differentiated and sharply defied colonies. 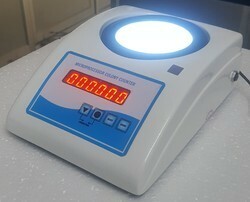 Fitted with automatic 3 digits LED Digital, Counting plate with illuminated standard filing ensures clearly differentiated and sharply defined colonies. Each touch of marking pencil in the Petridis increments the colony count by '1' and the glowing LED Display depicts the total colony count. Maximum colony Count possible up to mm dia lens cord and plug. To work on 220 V A.C. Automated colony counting system for microbial, pathological and bacterial work. - Automated colony count and classification of colonies according to size, shape or color.